Morgan Nelson follows through on a swing. The junior left fielder has recorded 22 RBIs in her last 12 games. With three games remaining in the regular season, Northwestern has already achieved its highest win total since 2014. When the Wildcats travel to Madison, Wisconsin, this weekend to take on the Badgers, they will look to secure a first-round bye in next weekend’s Big Ten Tournament. NU (33-14, 13-6 Big Ten) is tied for fourth in the conference standings with Ohio State. If the Cats stay there, they will earn a bye in the first round of the conference tournament, which will also be held in Madison. The Cats own the tiebreaker over the Buckeyes, having swept them in a weather-shortened series in April. Ohio State travels to first-place Michigan this weekend, giving NU a good chance at holding onto fourth if it takes care of business against Wisconsin. Key to achieving that goal could be junior left fielder Morgan Nelson continuing her recent offensive surge. Nelson has been an RBI machine lately, driving in 22 runs in her last 12 games. 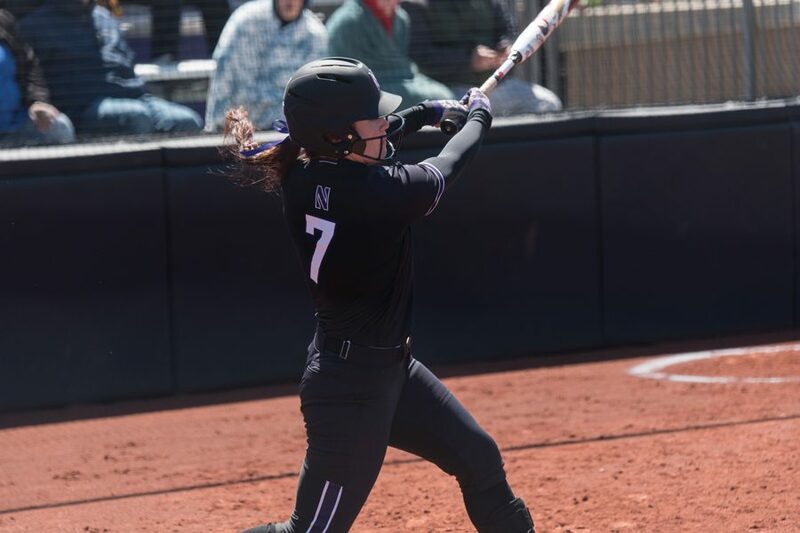 She has 6 home runs in that span, perhaps none bigger than a go-ahead 3-run blast Wednesday to help NU beat DePaul. Her position in the lineup has helped drive up her RBI total. Senior center fielder Sabrina Rabin, the Cats’ leadoff hitter, is batting .392 for the season. Freshman second baseman Rachel Lewis, NU’s biggest power threat, bats second. If opposing pitchers want to pitch around Lewis, they will have to deal with Nelson, the No. 3 hitter, behind her. NU’s bats have been firing on all cylinders lately, averaging 8.6 runs over its last 12 games. But the Cats’ offense will be tested this weekend against Wisconsin (25-19, 9-8), a team with a pair of solid pitchers in Haley Hestekin and Kaitlyn Menz. Hestekin is the Badgers’ ace, with a team-leading 14-6 record and 2.04 ERA. Menz was outstanding in her last start, striking out six and allowing just one hit over four shutout innings in a victory at Nebraska. That win completed an impressive sweep for Wisconsin, a series in which the Badgers outscored Nebraska 28-7. Wisconsin’s offense is led by Kelsey Jenkins, who is tied for the Big Ten lead with a .411 batting average. Brooke Wyderski also ranks in the top 10 in the conference, hitting .375 for the season. NU’s pitching staff seems to have righted itself after a rough stretch early in the Big Ten season, however. Behind sophomore Morgan Newport and freshman Kenna Wilkey, the Cats are allowing just 2 runs per game over their last five. Newport and Wilkey should both be fresh for the weekend, as neither was overworked during the Cats’ victory at DePaul.